* My field exam is coming up and I am therefore giving some thought to commodity demand once again. * In this simulation I will attempt to simulate commodity data that fits several empirical model specifications. * The advantage of this formation was that it allowed the elasticities to be easily recovered. * If consumers of fish have a fixed budget for fish and no strong substitutes then we expect that the price elasticity of fish to be around -1. * Let's see if we can generate aggrogate data that looks like this. 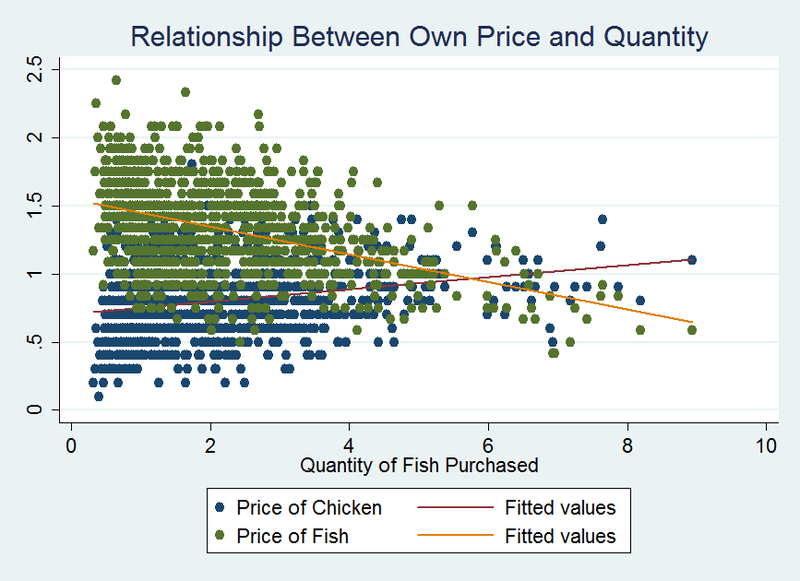 label var pchicken "Price of Chicken"
label var pfish "Price of Fish"
* Let's generate some fish covariates. * There was a scare that commercial fishing was killing dolphins. Let's say that happened at time 500. * Let's imagine that the fishing industry is also campainging to encourage the consumption of fish. 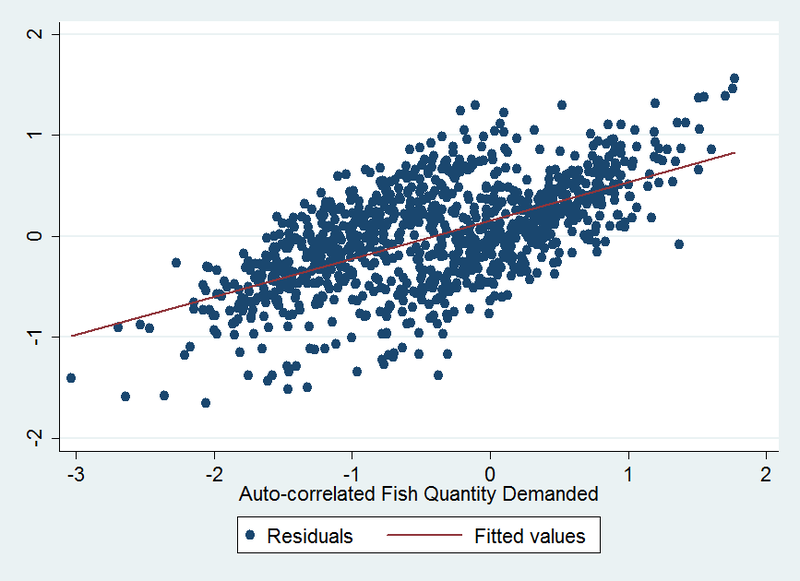 * Now let's generate quantity demand for fish! * I won't even bother estimating this. The reason is that by construction our data perfectly fits our OLS model. * Well, just a reference point I will estimate the above. * We can see all of our estimates work exceedingly well when the model is perfectly specified. * However, it might be instructive to look at the relationships between variables. 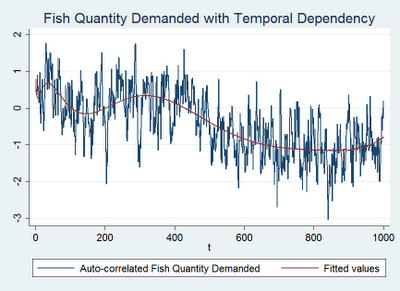 label var qfish "Quantity of Fish Purchased"
* This graph is a little bit busy and might be hard to read. * Notice that each point in blue is also represented in green. * This is because while the horizontal axis is the same the vertical axis changes from price of chicken to price of fish. * Let's imagine that rather than estimating using logs we estimated using quantities and prices. * It is interesting to note that while the estimates when the functional form is not speficied correctly are not as good as previously they still seem to be working well. * Let's try converting some of them to point elasticities and see how they compare. di "Point Elasticity of `v' = `=_b[`v']/r(mean)'"
* Some of the point elasticities are better estimates of the constant elasticity than just the coefficients but not consistently so. * Okay, so this has gotten our feet a little wet with the idea of estimating demand. * Now, let's shift into demand estimation given a more flexible forms for the demand to take. * Houthakker and Taylor's habit formation model. * The difference between this model and the last is that now we have a form of temporal dependence. * Consumption this period depends upon consumption last period. label var lnqfish2 "Auto-correlated Fish Quantity Demanded"
reg lnqfish2 t t? t?? * We can see long term movement in quantity demanded as a result of the dophin scare in additition to some short term temporal dependency as a result of habit formation. * As before, when our model is correctly specified we have little difficulty estimating the parameters. * We have less explanatory power, but generally almost all of the estimates are identical. 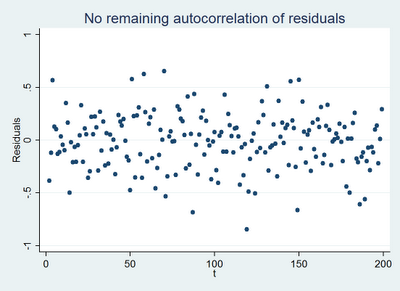 * There is a clear relationship between the y variable and the residual suggesting autocorrelation. * Even though there is autocorrelation of the errors this does not substantially affect the estimates of the demand function. * However, this is somewhat an artifact of the simulation. * We should think that there might be a causal relationship between amount of fish demanded during the previous period and current period prices if there exists some friction in the fish markets. 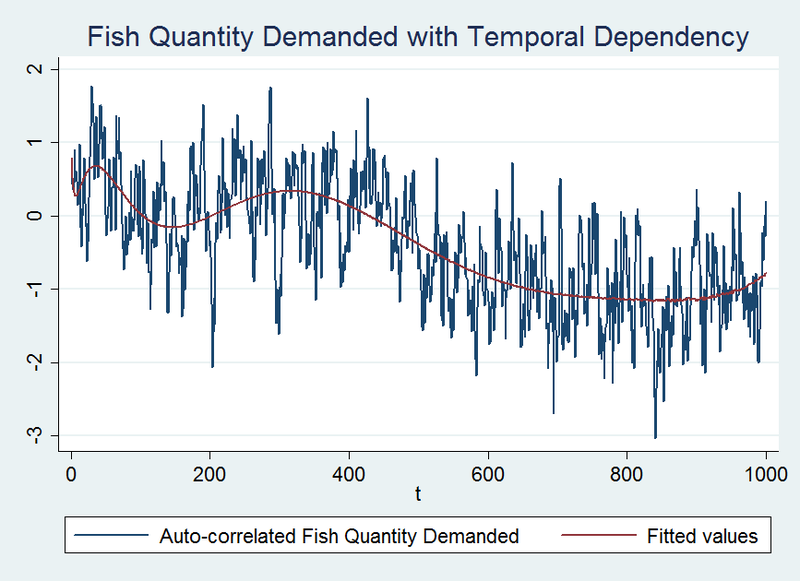 * Thus perhaps the higher the quantity demanded in the current period the higher the price is expected to be during the next period because of fish reserves. * This demands a more complex simulation in which we calculate each period individually. * For the first period we assume prices are exogenous. * For each additional period we will make prices a function of quantity demanded. * Thus the price elasticity is something less than 1/.7= 1.4. Less because there is the random poisson variation that diminishes the relationship. * Now failing to take into account the previous quantity of fish demanded causes the price elasticity to be downward biased. * The reason is that high quantity demanded last period will cause the habit of high quantity demanded this period. * However, high quantity demanded last period will also cause the price to be higher this period. * If you do not control for high demand last period then the higher price will look like it is explaining both the higher habitual consumption of fish and the lower consumption of fish due to the higher price. * Thus, controlling for habit formation is necessary for unbiased estimates. 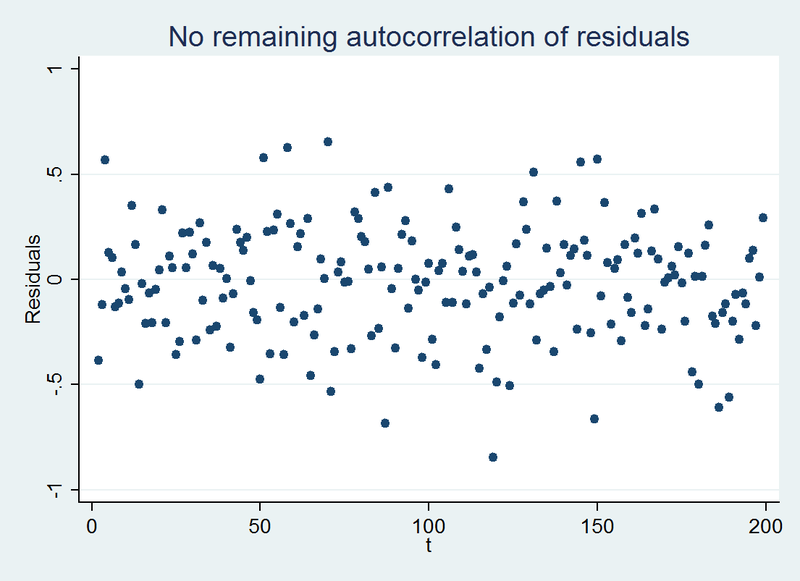 * After controlling for AR1 errors, there is no longer autocorrelation of residuals. Francis - a (system of) demand function(s) needs to be consistent with maximizing an underlying utility fucntiopn. Unfortunately, there is no sensible utility function which, when maximized, yields a log-log demand function. Good point. This raises the essential question, "How wed are we to economic theory?" If we are simply interested in a forecasting model then perhaps we don't really care that our model is disconnected from theory so long as we can predict reasonably well. However, there is a deeper question here as well. Do we restrict our predictive power because we do not have a theoretical model that fits the empirical model? It is easy to come up with examples for why empirical work is meaningless without a theoretical model. However, what happens when there is no reasonable available theoretical model and we are asked to answer a specific question? I don't don't have an answer for any of this. I am sure a theoretical economists would have an easy answer. But, it might not be the best or the right one though the one which is logically consistent. For instance, the demand function that is consistent with utility theory. But, what happens if utility theory is an untrue yet useful concept. Should we restrict our models to only those that fit within utility theory?